“I am Purplicious the Magician. Quartz is definitely a power stone. It is found in many places and as such it is the most common gemstone on Earth, but that does not take away from its brilliance. It has been called the “Universal Crystal” because of its many uses. It enhances energy by absorbing, storing, amplifying, balancing, focusing and transmitting. It channels universal energy. Quartz also enhances thoughts, as they are a form of energy. As such a great stone for manifesting, just like Purplicious is telling us. Because it directs and amplifies energy, it is extremely beneficial for manifesting, healing, meditation, protection, and channeling. It is also beneficial for storing and retrieving information of all types, as information is a form of energy pattern also. 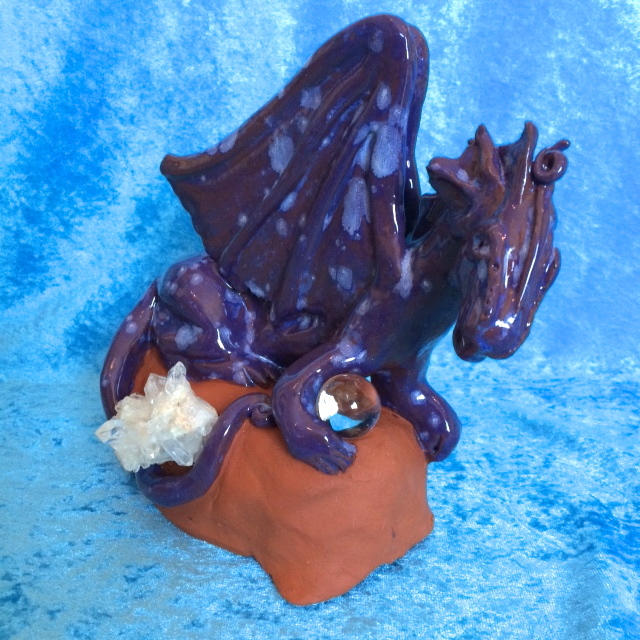 As the dragon is attuned to Dragon Energy the crystals are attuned to this energy as well, enabling to connect to the energy of Dragons more easily. 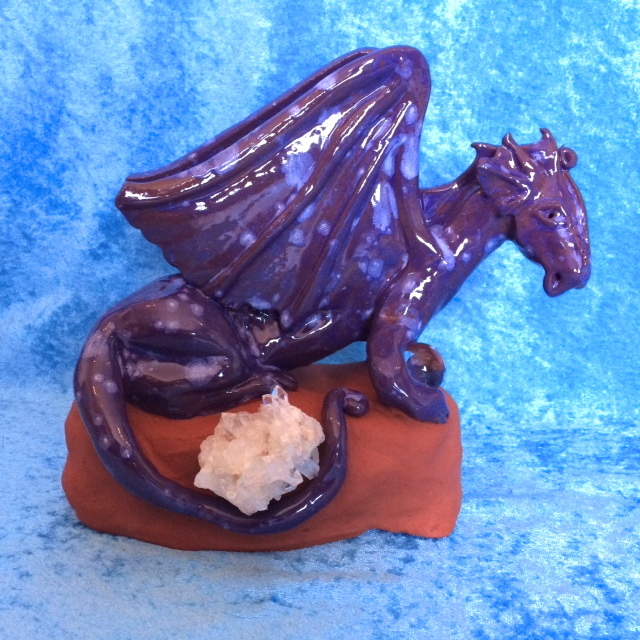 This dragon sculpture not only brings in fun ways for transformation and manifestation, it also protects you, brings harmony to your home and its fun energy brings creativity with it as well! Quartz is a stone of clarity which dispels negativity and clears away negative energy. It can be used to purify and clarify on the spiritual, mental, and physical planes. It is powerfully protective because of these properties. Quartz enhances spiritual growth, spirituality and wisdom. Because it clarifies thought processes and emotions, it can increase inspiration and creativity. It can also help particularly with concentration, studying, and retaining what one learns. Quartz is also a stone of harmony because it balances energies, and is even helpful in romantic relationships. Lastly, quartz is a Master Healer stone. It is an excellent all purpose crystal healer stone. It is said to amplify healing energy and is used to perform diagnostic healing. 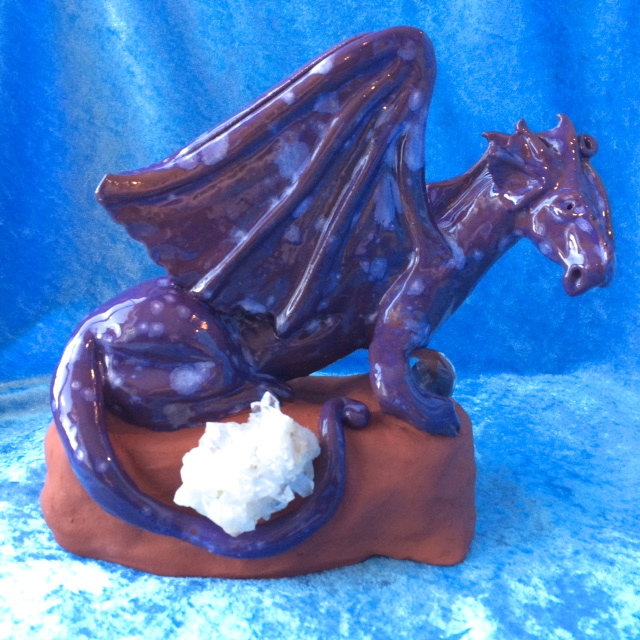 This entry was posted in Dragons and tagged angel light heart, clear quartz, dragon, manifestation, sculpture, transformation, transmutation on February 19, 2015 by Angel Light Heart.